We had a lot of fun last night and were able to pull up to the dock at the end of the night with our head held high. Efren, Leo, and I fished from 6 to 9:45 pm. I had been trying to get my friends from Mexico into a few salmon, but we didn't have much luck the last couple of times out. Well, the fish were biting again, and biting on everything that we threw out on the line. We ended the night 6 for 9 with bites on 7 different set-ups. Downriggers at 40 and 45 down got 3 hits, 2 of which were on a flasher/fly meat rig. A 4 color lead line with an orange and gold spoon got one. Both 10 and 12 color lead lines with spoons also took hits - 2 of which were on a small ladder back Pro King spoon with black and green sides. Dipsies and Flies also had 2 or 3 hits. Both a magnum wonder bread and a silver wonder-bread got hits. Our luck came in 130 FOW and we we circled and did figure-eights through the same spot all night, picking up a fish each time through. Of the 6 fish we landed, 5 were good size kings and 1 was an 8 lb steelhead. One of the Kings weighed 22.4 lbs on the scale! This was the biggest fish my boat has seen in a few years! 2 Other Kings were over 10 lbs. We lost another 10+ pounder right behind the boat as it crossed up with our dipsy as it made a last second run. On board the J D Lady Sunday 7-22-13 AM we fished north of the Holland pier in 100-170 FOW in rough and confused seas. Wind was ENE at 15-18 mph with a strong north current. I had two ex-Navy veterans on board which was good because anyone with poor seas legs in the AM would not have lasted long. The bite was somewhat slow but steady and we ended up 7 fish for 9 bites. The kings were 3-4 year olds and nice sized. The big bonus was a 12 lb 4 oz brown that we took in 140 FOW on the rigger just before we wrapped it up. Meat rigs and regular sized spoons worked the best. The PM trip was just the opposite from the AM trip with flat calm seas and very little wind or current. We set up almost in the same spot I left in the morning and caught a small steelhead and small king in the first hour and then it slowed down. We fished out to 190 FOW with a good number of fish on the screen but not much action. The rain and clouds came about 6:00 PM and with it the fishing improved greatly with doubles and a quad right before we beat the storm back. The end tally showed 9 fish for 12 bites. If I put both boxes of fish together, we managed to catch kings, cohos, steelhead, lake trout, and a brown trout in one day. Now that's a mixed bag! It was difficult fishing last night. I probably wouldn't have gone, but when you have friends from Taiwan and Mexico in town, its better to go out, than miss an opportunity. Because of 3-5 foot waves and a strong current, we started out with a few tangles and decided to only fish 5 lines and we couldn't be very selective in our troll direction. We ended 0-1, with nothing to show for our effort, except for 1 seasick Mexican. We fished in mostly the 100-120 depth from Holland to Saugatuck. Fishing aboard the J D Lady on Tuesday 7-9-13 was good in spite of 50 yard visibility due to the fog the entire trip. 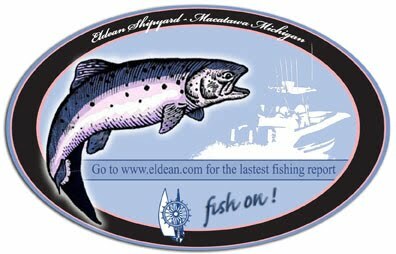 Fellow marina slip holders and family were on their first time salmon fishing charter and did an outstanding job of landing 11 fish: 9 salmon and 2 steelhead. The best water for us was 100 - 120 and depths were 50- 60 down. All hits were on spoons; blue in the morning and orange in the afternoon. Efren, Pauliz, Capt. Steve and I tried fishing Tuesday morning from 6:30 to 10 in 80 to 180 FOW and had 3 bites, but never could keep a fish on the line. Efren and I went back out and fished from 8:30-9:30 pm and once again, got nothing. This may have been my most disappointing day of fishing yet! I have heard that the Lake Trout are biting, so if you know how to target Lake Trout, you'll probably get a few.